From the May-June and November-December 2018 print editions of the Informer. In the Statehouse, King set to work cultivating his controversial reputation through actions like filing a lawsuit that prevented Tom Vilsack, the Democratic governor who succeeded Branstad, from implementing anti-discrimination protections for LGBT employees in the executive branch. But his focus remained on immigration-related issues. He introduced his so-called God and Country legislation, which, had it passed, would have stripped multicultural education requirements from school curriculum. And he pushed for an English-only bill until, in 2002 after a years-long effort, he got his wish, earning Vilsack’s reluctant signature that March despite allegations about its discriminatory intent. Two months later, King overpowered House Speaker Brett Siegrist in the state’s first nominating convention in nearly four decades to win his party’s backing for the 5th Congressional District, propelling him to his current position as one of the nation’s most notorious immigration hardliners, a man who now routinely espouses views in line with those of white nationalists. 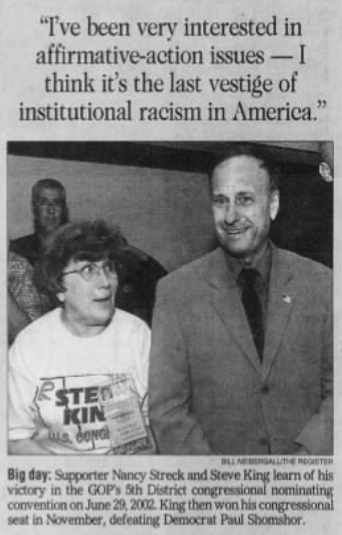 A clipping from the Sunday, April 13, 2003, edition of the Des Moines Register quoting King with a photo of the congressman on the day he learned that he’d won the GOP’s 5th District nominating convention in 2002. By the mid-1960s, King was attending high school in Denison, an expanding town with a population nearing 6,000 but scant diversity, near where he would make his pitch for an English-only law 30 years later en route to the state Senate. Just two African Americans, the Johnson brothers, attended the school. It wasn’t until after he graduated and moved to a farm outside his current home of Kiron that the first wave of Southeast Asian and Latino immigrants — refugees and job-seekers drawn to meatpacking plants in Storm Lake — hit northwestern Iowa. King’s views were further influenced by the writings of Thomas Sowell, an African American academic known for parroting conservatives cliches about how social welfare harms black people and “all lives matter.” In 1996, Sowell published Migration and Cultures: A World View, which King told Offenburger he’d read “forward and backward at least three times.” The book criticized multiculturalism and affirmative action, arguing that they “add to the cost of absorbing immigrants, not least by increasing the resentment of them by the native population,” and labeled immigration advocates “ideological zealots.” Anti-immigrant sentiment, Sowell argued, was driven by “lax immigration laws, welfare state benefits, and schemes to keep foreigners foreign,” rather than allowing them to assimilate into American society. Growing up in Goodell, Steve King enjoyed playing chess — the only board game in the house — with his father and younger brother, Jon. “It teaches you to be logical and not emotional,” Jon told the Sioux City Journal in 2012, “because there is no emotion in chess. If you start getting upset, you lose control. “A lot of the decisions that Steve makes that are so unpopular at first are because he removed emotion from it and got right down to the brass tacks to begin with,” he went on. “We have so many people in Washington that are making decisions based on emotion, the way it makes them feel. That is a mistake. King came closer than ever before in November to testing that hypothesis, which Burns published a few months before the congressman coasted to an eighth term in a 22-point rout of Kim Weaver, his Democratic rival then. The 2018 election, on the other hand, presented a striking study in contrasts for the notorious Iowa lawmaker, who found himself at once both in the most powerful position of his political career but also at his most vulnerable. On Nov. 1, five days out from an election he would win by just 3.4 points — 10,430 votes above his Democratic rival, a former baseball standout-turned-paralegal and political novice from Sioux City named J.D. Scholten — King attended a candidate forum hosted by the Greater Des Moines Partnership, a business coalition similar to a local chamber of commerce. His appearance came under the cloud of a report in the Washington Post revealing that he’d met with members of Austria’s far-right Freedom Party, which was founded by former Nazis, during a trip to Poland to visit Jewish historical sites including the Auschwitz-Birkenau death camp. The trip was funded by the nonprofit From the Depths, an international Holocaust memorial organization. In Des Moines, King expressed his relief — prematurely, in part — that Nancy Pelosi and Barack Obama were no longer calling the shots in Washington. Channeling Trump, the congressman then told a bald-faced lie: “You never heard me say a thing, a personal criticism — policy criticism of Barack Obama, yes, but not personal.” In fact, King was a leading proponent of the conspiracy theory, whose early embrace by Trump arguably propelled him to the presidency, that Obama had a fake birth certificate and may have been born in Kenya. King also once tweeted a racist cartoon suggesting a Turban-clad Obama was a Muslim and, before the 2008 election, warned that al-Qaeda “would be dancing in the streets in greater numbers than they did on September 11″ if he became president. King thrust a finger at Van Fosson, threatening to leave the forum if he didn’t stop talking. “We don’t play these games here in Iowa,” he barked. “You crossed the line. It’s not tolerable to accuse me of being associated with a guy that shot 11 people in Pittsburgh. I am a person who has stood up for Israel from the beginning, and the link to that nation is a link to my life, and I’ve been with them all along and I will not answer your question and I’ll not listen to another word from you.” Van Fosson, who remained calm throughout the exchange, was booted from the event, and the Partnership’s moderator, local attorney Tim Coonan, later thanked King for his civility. It wasn’t the first time the congressman was forced to respond to his ideological connection to a mass shooter. In June 2015, a 21-year-old white supremacist named Dylann Roof slaughtered nine black worshippers at the Emanuel African Methodist Episcopal Church in Charleston, South Carolina, in an effort, he said, to instigate a race war. On a website titled The Last Rhodesian — a reference to the white minority rule of what’s now Zimbabwe — Roof had posted a manifesto that credited as an inspiration George Zimmerman’s killing of Trayvon Martin, a black teenager walking back from a 7-Eleven to a relative’s house, during a 2012 neighborhood watch shift in Florida. After the church massacre, the group issued a statement saying its members “utterly condemn Roof’s despicable killings, but they do not detract in the slightest from the legitimacy of some of the positions he has expressed.” Around the same time, news emerged that the group’s president, Earl Holt, had donated to several prominent Republican politicians including Steve King, who received five $500 contributions from June 2012 to October 2014. In a brief statement, the congressman’s campaign said it would give the money to the church and a fund established for the victims. Pittsburgh synagogue shooter Robert Bowers’ final post on Gab, a social media website frequented by racist extremists, which accuses a Jewish nonprofit focused on refugee resettlement of being perpetrators of a white genocide conspiracy theory. Steve King has also recently promoted a a version of the same conspiracy theory. Under the username onedingo, Bowers posted a slew of discriminatory messages on Gab. His cover image referenced the Fourteen Words, a white supremacist slogan coined by neo-Nazi David Lane that goes, “We must secure the existence of our people and a future for white children.” He posted anti-Semitic conspiracy theories about George Soros, a Hungarian-American billionaire philanthropist who’s a major funder of progressive and pro-democracy causes. In other posts, including the one Van Fosson cited, Bowers promoted the concept of white genocide, a conspiracy theory started by Lane warning that the white race will soon become a minority population, if it’s not eliminated altogether, in countries under attack by various combinations of mass immigration, race-mixing, abortion, low birth rates, and, in the cases of nations like Zimbabwe and South Africa, government land seizures. Shortly before his appearance at the Des Moines forum, King endorsed Faith Goldy, a white nationalist fringe candidate for Toronto mayor who ended up with 3.4 percent of the vote. In the recent past, Goldy had come under fire for being interviewed on a Daily Stormer podcast, reciting the Fourteen Words on another far-right podcast, and repeatedly promoting the white genocide conspiracy theory. The congressman himself endorsed a version of the same theory, referred to as the Great Replacement, during his recent trip to Austria, where he was interviewed by the far-right, Freedom Party-linked publication Unzensuriert (which means “uncensored”). King explained that he learned about the theory by reading The Camp of the Saints, a xenophobic novel by French author Jean Raspail published in 1973. The book is a favorite of Steve Bannon’s, Trump’s former White House chief strategist who previously ran the alt-right news site Breitbart. It envisions a migrant invasion of racial minorities who threaten to destroy Western civilization. In the interview, King suggested that Soros was financially backing the Great Replacement. The congressman also frames his anti-abortion views, which played a key role in his initial election to the state Senate in 1996, using white nationalist rhetoric. His “somebody else’s babies” tweet, in which he endorsed Geert Wilders, a far-right Dutch politician, for prime minister, is the most recognized example of this, but far from the only one. “We have a birthrate that’s down now, a low replacement rate, and that’s starting to affect the new people we would otherwise have,” he said during his January town hall in Primghar, responding to a question about the economic stagnation afflicting the 4th District by blaming it on abortion. Jon King’s other post shared a video from Afterburner, a program on the right-wing PJ Media’s now-lapsed online TV network hosted by Bill Whittle, who is a proponent of scientific racism, or the belief that minorities, genetically, are intellectually inferior to whites. (In an interview with alt-right figure Stefan Molyneux, whose podcast Steve King appeared on in 2017 to argue that the Congressional Black Caucus was a “self-segregating” “grievance committee” that had hijacked Martin Luther King Jr.’s message, Whittle cited a white nationalist to argue that inner-city blacks “don’t have access to cognition.”) Titled “The Lynching,” the Afterburner video lingers on a crime-scene photo of Martin’s lifeless body and another photo, found on Martin’s cell phone and later released by Zimmerman’s defense team, showing him flipping off the camera. Whittle assassinates Martin’s character, portraying him as a delinquent, drug-using thug and claiming that messages found on the minor’s phone revealed he was “violent and highly sexualized.” Whittle would go on to become a commentator for the National Rifle Association’s NRATV. He expanded on this dubious logic in an interview on WHO-TV’s The Insiders after endorsing Goldy. “Is she a supremacist, like these articles say?” asked Dave Price, the program’s host. “Well, I’m not sure of that,” King said, then mentioned a past president of the NAACP’s Spokane, Washington, chapter who resigned in June 2015 after news broke that she was claiming to be black despite having white European ancestry. “I mean, first of all, I think you have to be white, but then we’ve got Rachel Dolezal that didn’t have to be black to be black, so it is a derogatory term today.